Businesses need to rely on connectivity and the Meru AP1000i Series is engineered to provide the world's most reliable mobile connectivity. Supporting both the 2.4GHz and the 5GHz spectrum and backwards compatible with 802.11a, 802.11b and 802.11g, the AP1000i Series is an ideal solution to transition your network to 802.11n without leaving your legacy clients behind. 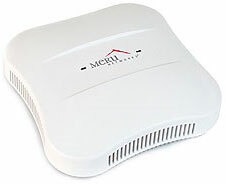 AP1020i, Dual radio 802.11a/b/g/n access point (AP) with integrated antennas providing 180 degrees coverage. AP can be mounted horizontally (below the ceiling) and vertically (on a wall). Other optional mounting brackets and screws also available. AP1010i, INTRODUCTORY PROMOTIONAL PACK. Pack of 48, Single radio 802.11a/b/g/n access point (AP) with integrated antennas providing 180 degrees coverage. AP can be mounted horizontally (below the ceiling) and vertically (on a wall). Other optional mounting brackets and screws also available.